Something in a cluster of life caught my eye while diving at Nelson Bay a while back. I went in to look, and it was an anemone. As I watched, it ambled slowly away. The photo above reveals a couple of legs, and the one below shows the whole combination. The anemone was being carried by a Hermit Crab, probably Dardanus pedunculatus (or another species of Dardanus). The crab’s bespectacled-looking eyes are over to the right. 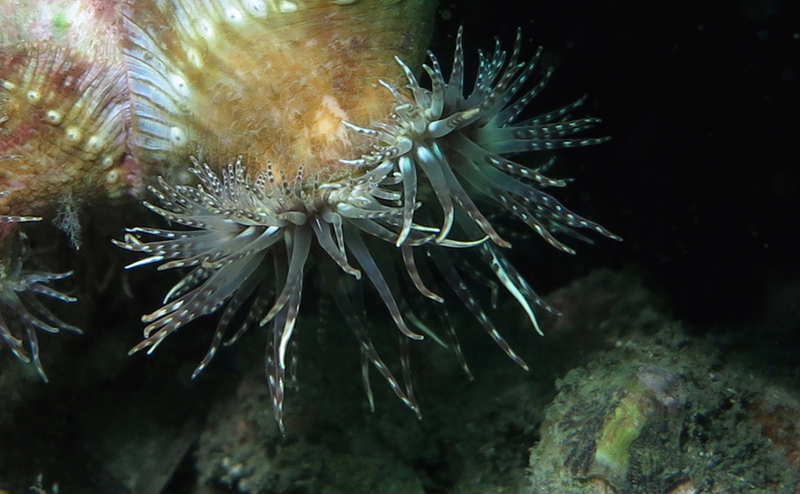 The anemone is probably Calliactis polypus (or another in the genus), the standard partner of these crabs. The crabs gather the anemones and place them on their shells – via some stroking and coaxing, needed to induce the anemone to give up its grip on the object where it was found. Hermit/anemone partnerships have been closely studied as “mutualistic” relationships; both sides gain protection from predators (in at least some cases). 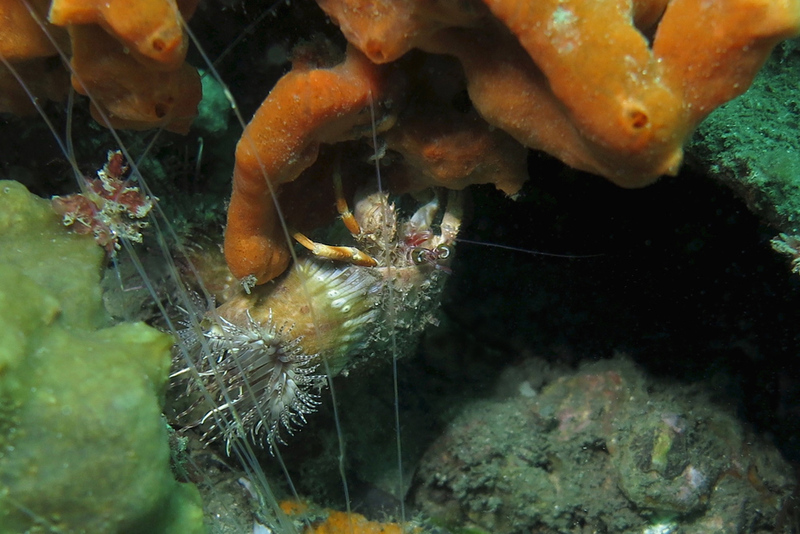 The crab is protected from octopuses by the anemone’s stingers, and the anemone is protected from starfish and other slow-moving but chemically resilient foes by the crab’s locomotion. Here is some video of them (about 25 seconds). The crab is carrying a total of three anemones on its shell, and the result looks extremely awkward for the crab. ** That suggests the octopus protection is quite valuable (and this environment certainly has a profusion of octopuses). You may, like me, have been slightly annoyed by those thin filaments stretching all through the photos. I’ve occasionally noticed them at this site and they’ve made a mess of some images. But now I learn that they are part of the story. I am pretty sure they are acontia – filaments produced by anemones. These are bodily extensions used for predation and defense, as they are packed with stinging cells. In this case it does not appear that the threads were produced by the crab’s own anemones – they seem to be coming from below the sand surface. But I’m not sure, and these Calliactis anemones do produce acontia. 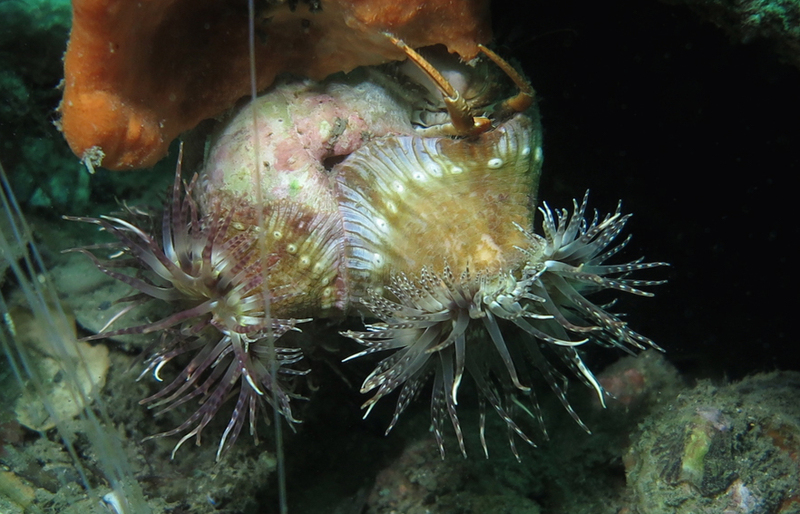 I was reminded of the crab-anemone combination recently during a dive at Jervis Bay. 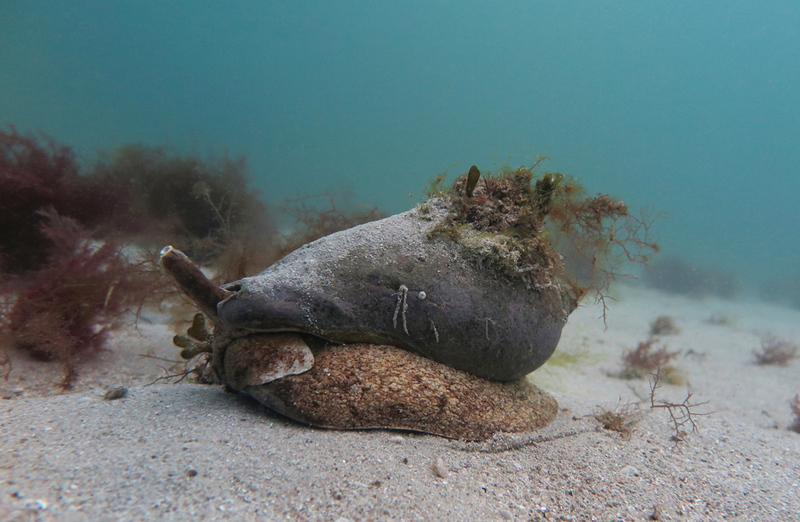 Volutes are giant marine snails who wander the sea floor. The one below was carrying a little community on its back, with several kinds of algae, some tubeworms, and who-knows-what-else. I half expected to see an octopus riding along there. In this case I expect there is nothing like a mutualistic relationship operating, and this is the first volute I’ve seen with so many companions. The video below shows their stately passage along the sand. * Update (November): not quite so far-fetched now! See this film. ** There have been studies of how the crabs place anemones on their shells – rather meticulously – and how they handle the overbalancing that results. This entry was posted in Arthropods, Cnidarians, Symbiosis and tagged anemone, hermit crab, symbiosis. Bookmark the permalink.